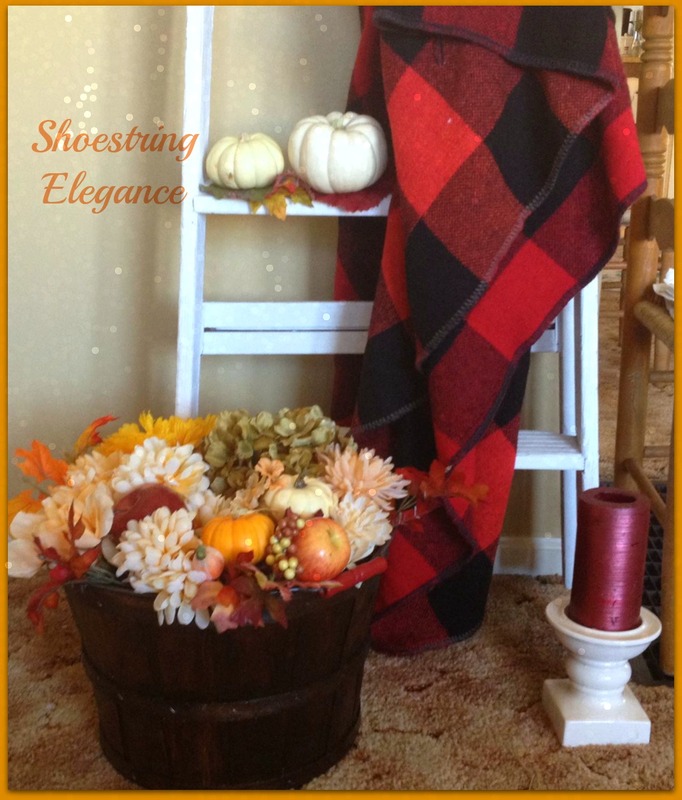 Have you ever noticed when you start doing crafts, or celebrating the Seasons more, around your home, that you find inspiration everywhere? Things that you may not have looked at or thought about twice before now come to life in your imagination? I certainly have found that to be the case for me & I love it. Autumn is such a wonderful time of the year, for me. I enjoy the shorter, cooler days with baked goods in the oven and soups on the stove. So, for me, It is imperative that my home celebrate that love of the Season, too. 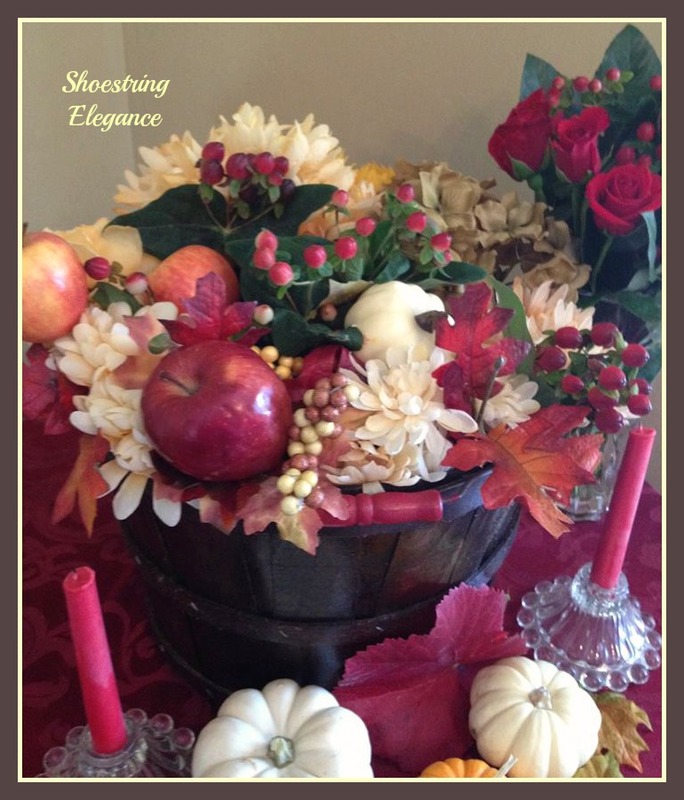 That being said, What do you think of my beautiful Fall Harvest Bushel? Yes, it's a full bushel, not a half and certainly not a peck! I'm laughing as I type this. I learned more about bushels in the last couple of weeks than I am sure I will ever need to know! "Sonoma County Antique, Chic, and Unique" Don't you just love that name?! It is a fantastic resource for great finds of all kinds! 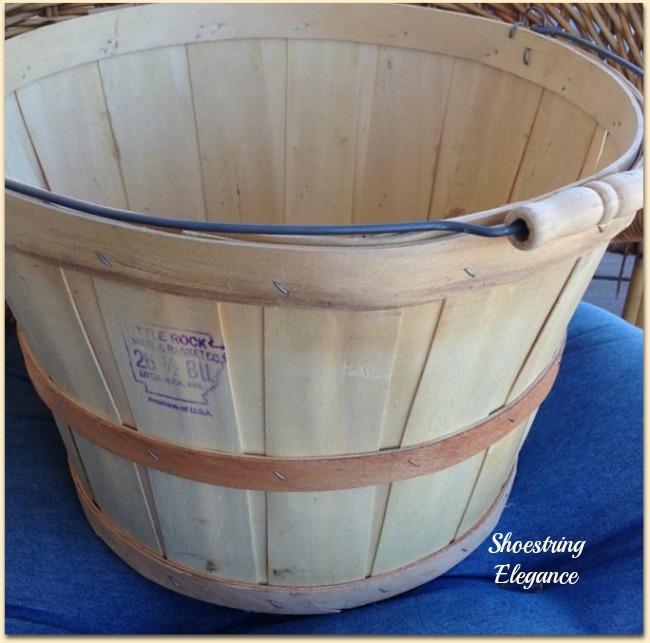 From higher-end Antique pieces of furniture to your very basic "just cleaned out the barn, come and get it" kinda buys. The latter is my favorite! Something like what I lucked out on in the picture below. 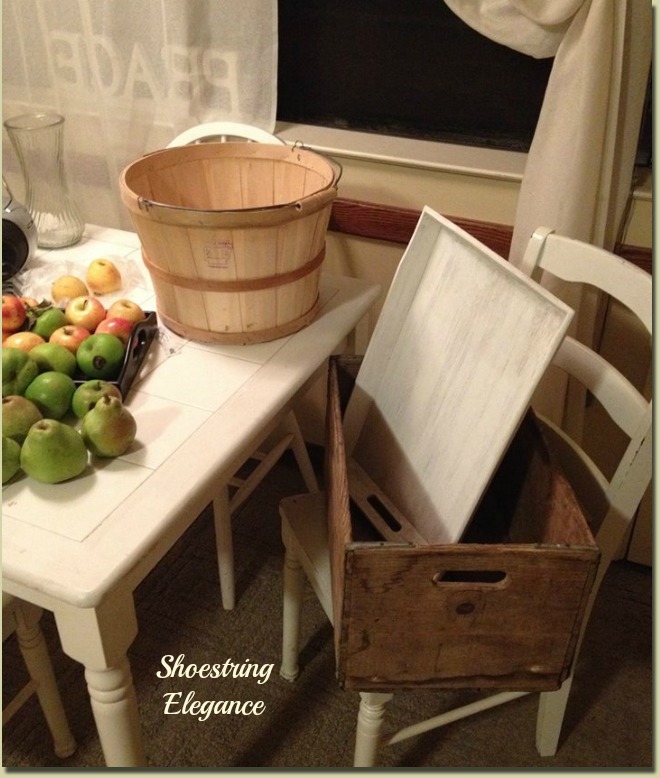 I bought a fantastic, truly antique, old crate (that I love), my unfinished, raw bushel and cute little tray, that the seller had, actually, begun to paint with her own homemade chalk paint awhile back! Score! That'll save me some time, I hope. So, the big question, How much did these treasures cost me?... I paid a whopping $15, for all three! Can you feel my smile?! My mother often says to me, "now, don't you feel guilty for paying so little?" My answer is always a resounding, "Nope, not one bit!" Here are the truly, still dirty, "befores"! As you can see, I still had apples and pears, from my crisp baking, with more to make! I'll be sharing more about the crate and tray with you later. For today, I want to tell you about this bushel! I fell in love with it immediately. It's not an easy to find one with the wooden handle on it, like this one. The handle that I knew, in my mind instantly, was going to be painted red! So, here is what I started with. Isn't it cute? In my mind's eye, I could see it in a darker wood, filled with blossoms and fruit and berries and mini pumpkins!! Full of Fall's Harvest! A little something like this! But, alas, it didn't come that way! So, what did I do to get it like this? That what I'm, going to share with you today! 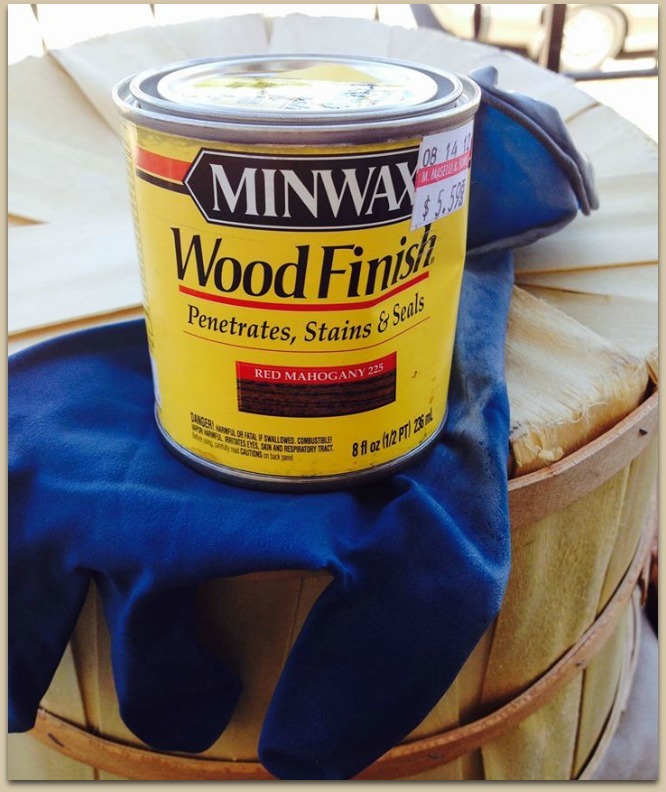 You know those old oak barrels that look so gorgeous with a beautiful dark stain and shiny finish? 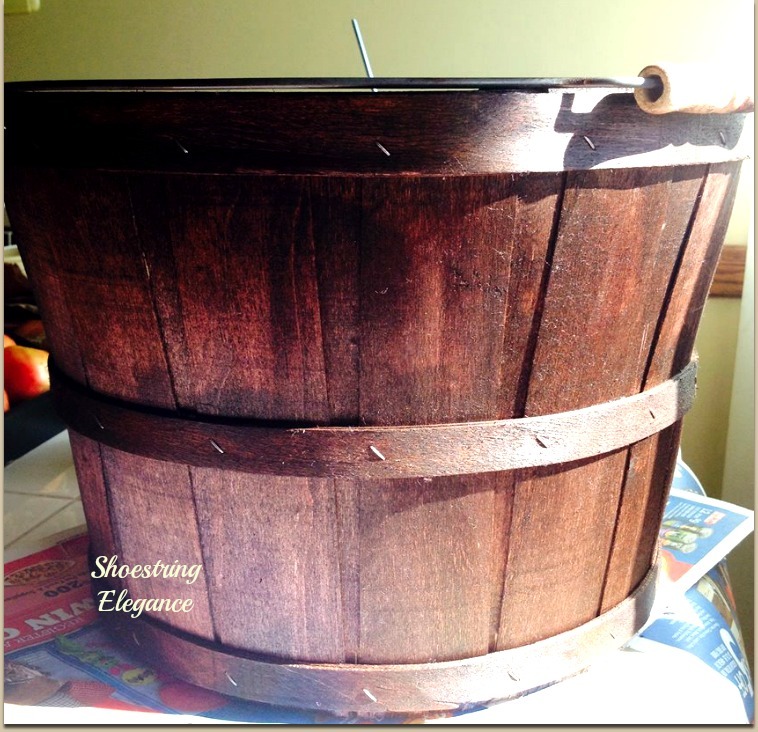 I was convinced I could achieve the same look with this little Bushel! I think I came pretty close. Close enough for me, anyway. First, the color. After some looking around I settled on none other than, Red Mahogany stain and seal from Minwax. I thought that would work out perfect! I began, with some extra, durable gloves and a great old rag! Little by little rubbing the stain in, filling in all the little nooks and crannies. (I also used a foam brush to get into all the little hard to reach spots) Finally, I saw the color I was looking for. Once I had, I continued with it inside and out, top and bottom, until there wasn't a hint of its former color. 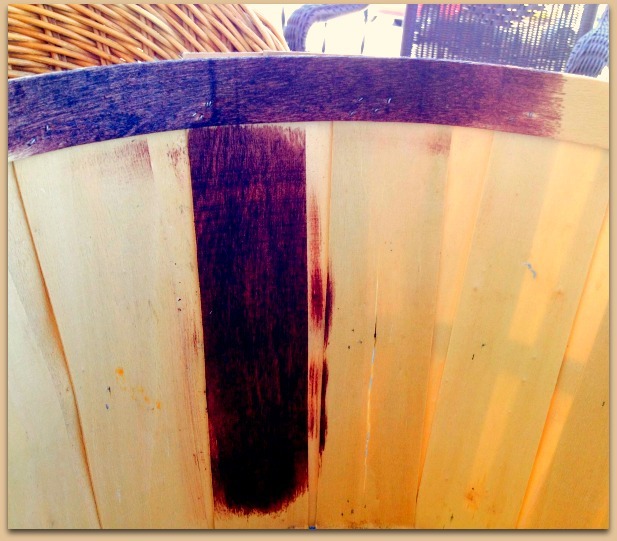 I love how the simple addition of a stain brought out the grain of the wood like I had hoped it would. Once done, it had to sit for a day or two to absorb and dry. When it was completely dry I covered it completely with a couple coats of Polyurethane, to give it that nice sheen. The end result was this! It was exactly what I had hoped! I pondered whether I should paint the band around the center or the top red, but decided against it after seeing the way it had dried, I was quite pleased with the dark wood look of it. 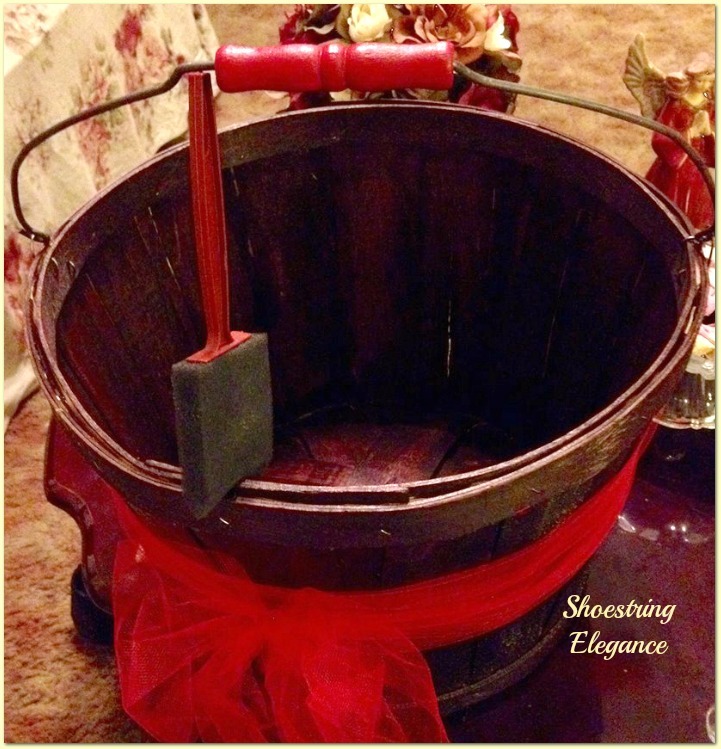 But one thing was for sure, I was painting that lovely wooden handle Red! Seen here, below, with a red bow tied around it while (I was still deciding on the trim) and something like this helps me get an idea of how it would look. 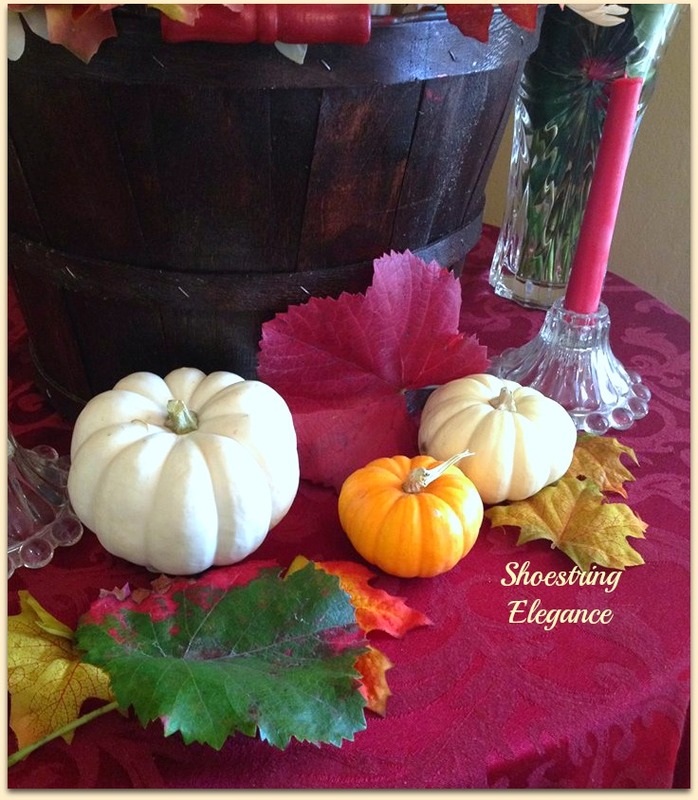 I picked up some of the cutest little pumpkins for putting in and displaying in front of the Bushel. Aren't the adorable? One of the easiest and funnest parts of putting this together was being able o use the beautiful leaves, from the grapevine, that lines my driveway. They are so gorgeous. I couldn't buy anything as beautiful as the colors that these are right now. I picked the varying colors I wanted to use and laid them on the table and just smoothed them out or 'polished' them a little with a clean rag. Someone told me, a long time ago, and I don't remember why, that if you want your leaves to stay, and dry beautifully. to take a hammer and hit the end of the stem. As I said, I don't remember exactly why, but I do it and it seems to work quite well. I put a few different kinds of fresh apples, that I had on hand, on the end of bamboo skewers and incorporated them into the blooms, leaves, and hypericum. I, generally, don't like pictures taken with a flash at night, but I absolutely loved the way the colors looked in this image. So, I kept it in. Once I had it just how wanted, it was time to pour myself a cup of tea and enjoy the display. I know I've said this before, but I really do think this is one of my favorite before and afters! As much as I love the tablescape this made and enjoyed looking over it. The ultimate question of 'where will it live when I need the table' was in my head. And, honestly, God just gave me instant inspiration on this one! I just finished taking the final images I wanted to share with you here, and I looked over at my ladder display & thought to myself. " that will need to be redone for Fall " & right then, I realized where my little bushel was going to live! So there it sits, the first thing one sees when coming through my front door. I removed the Hypericum and some of the fresh elements so it won't require regular tending. I hope you are enjoying the beginning of the new Season and celebrating it in some way at your house, as well! Happy Autumn 2014! This will only happen once, so let's all make the most of it and enjoy! 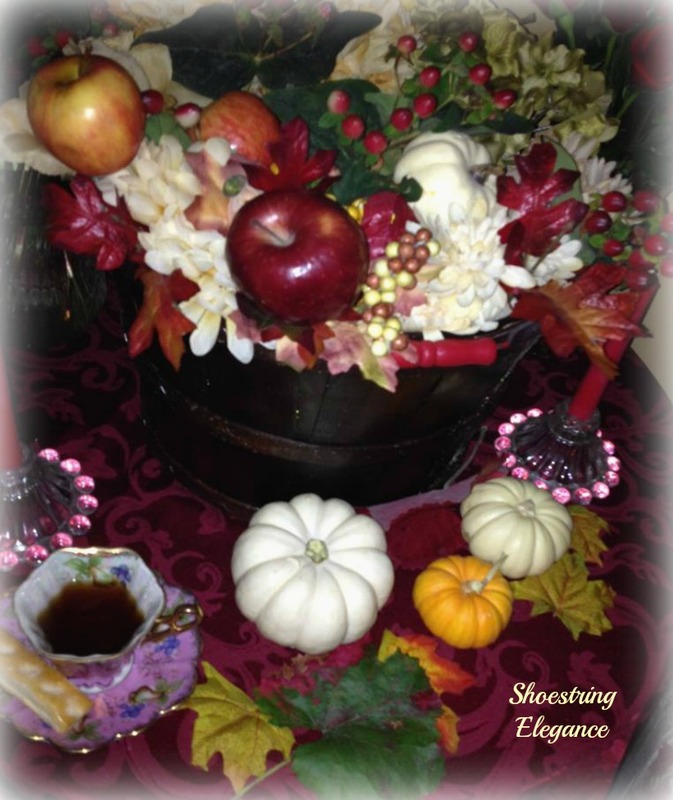 Many Blessings to you all for this beautiful, colorful season upon us! This post was Featured by the very wonderful and talented, Joy @ Yesterfood. Beth, you are so sweet. I'm so sorry about your hand. Hopefully, on the mend?! Beautiful..I love the basket. Makes me want one! Thank you, Shirley! Well, you netter got on the hunt. If you do make one, please come back and share it with me..
Well I learnt something new today-I had no idea what the song 'Bushel and Peck' meant until reading this so thank you for educating me! 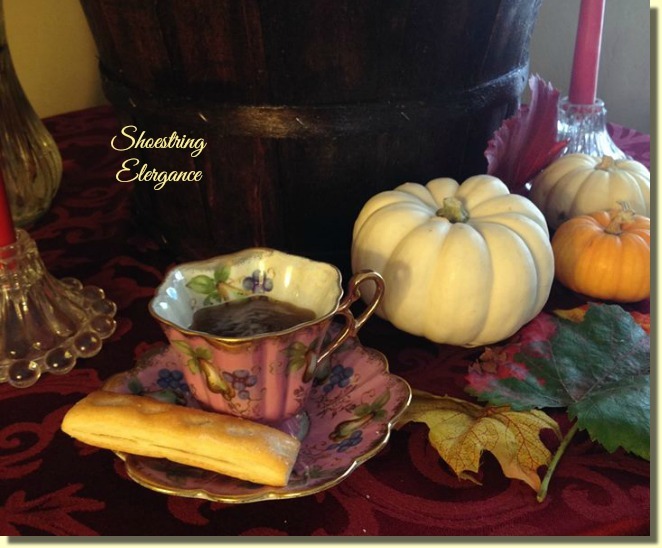 Thanks also for sharing this post at the Say G'Day linky party! I know, Natasha! Bizarre, huh?! LOL As I said I learned alot about the topic! Thank you, sweet Lady for your kind comment and wonderful Parties! Wishing you a wonderful week in return! Oh Joy, Thank you so much! This project, as I said, was very near & dear to my heart! I really appreciate your support! I love Treasure Box and Yesterfood! 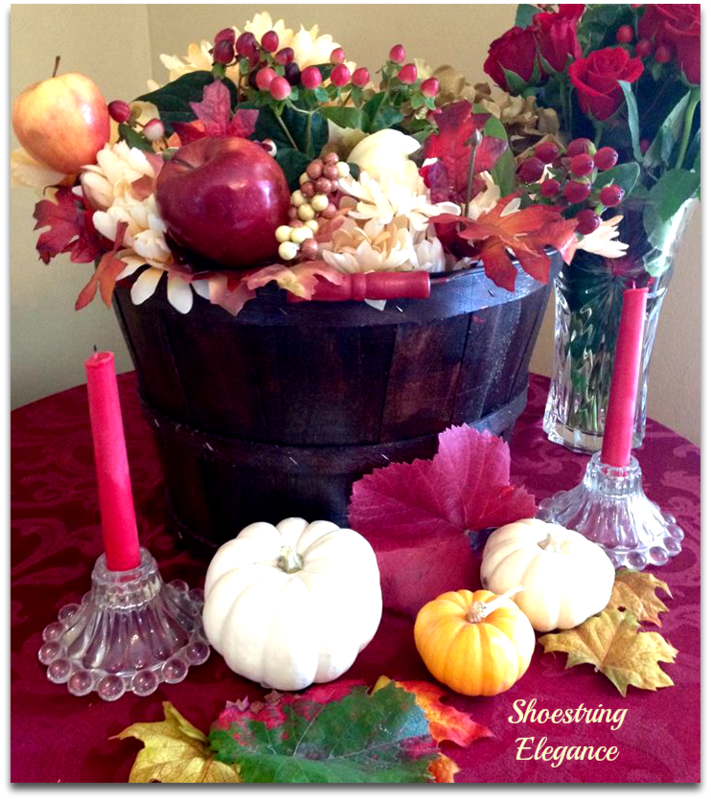 I love bushel basket filled with autumn goodness! Yours looks so festive!